the price of grain will in the future be linked to the price of oil, and the danger posed to civilization if food and water shortages and hunger continue to increase. Read Fears for the world’s poor countries as the rich grab land to grow food. Brown’s recent book titled Plan B 3.0: Mobilizing to Save Civilization is published by W.W. Norton. It can be purchased in print or downloaded for free. Read A Conversation with Lester Brown in the summer 2009 issue of Earth Island Journal. Read Brown’s article in the May 2009 Scientific American, Could Food Shortages Bring Down Civilization? At the start of the program, Brown describes the components of a failed country, and lists nations which meet this description. He says that as the list of failing states grows, the fate of these nations may create a failed global civilization, with major repercussions for all humanity. One of the problems affecting failed states is deforestation and soil erosion. Read geologist David Montgomery’s article Soil erosion and agricultural sustainability and buy his book Dirt: The Erosion of Civilizations. Brown says a country like Haiti, an “ecological basket case,” is in many cases also an “economic basket case.” How the First World may block aid to the Third World is also worth noting. Read the July 6 Oxfam International press release More than 3 Million Face Death [in Subsaharan Africa] while Berlusconi and the G8 Fiddle about how “urgent action” is needed “to protect poor people from the triple threat of the economic crisis, rising food prices and climate change.” The failed-states issue is one of many incredibly urgent topics on this week’s episode. Also see the July 6 Oxam press release about their new report on hunger and climate change, Millions Face Climate-Related Hunger as Seasons Shift and Change. Dr. Caldicott brings up the Amazon rainforest, and Brown then delineates the three major land expansion efforts over the last century, one of which is leveling the Amazon. Brown notes how some of the disasters spawned by earlier land-expansion strategies were later reversed through careful conservation and planning. The fate of the Amazon rainforest is crucial to the health of the rest of the globe, particularly in terms of climate change. Read 85% of the Amazon may be lost due to global warming. Brown discusses the relationship between food production and world hunger; which countries are changing from food exporters to food importers; and how crops grown for animals and for fuel will create more food shortages for humans. Brown says that the world used to have a separate food economy and energy economy, but now with ethanol, these economies are totally interconnected and interdependent. Up to one-quarter of the U.S. grain harvest is now going toward fuel for cars. Dr. Caldicott points to the folly of “feeding cars not people,” and creating more CO2 than is produced processing petroleum. Brown says that all the latest findings say that there is a net increase in carbon emissions when growing corn for ethanol (which also may involve major deforestation to create more cropland). Global warming will also cause food shortages. Read Half the world’s population faces major food crisis by 2100, Science study finds. Brown notes the increasing competition between the 860 million people with cars who want to maintain mobility without concern for the fuel source, and the vast majority of the world’s people whose primary concern is survival. He describes how the number of hungry people is now increasing, not decreasing, and may reach 1.2 billion by 2017. 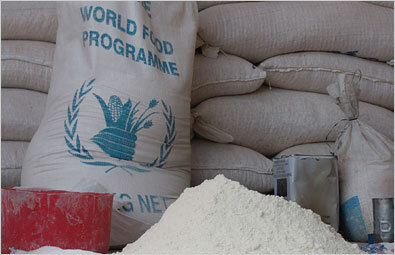 With food prices on rise, the world could see more failing states, as governments may not be able to provide food. Another critical issue affecting the world community is falling water tables. Brown talks about the melting of glaciers in the Himalayas and on the Tibetan Plateau, and what the loss of the glacier water will mean to the major river systems in China and India. One dramatic effect of this projected loss of water is that China, the world’s leading wheat producer, and India, the second larger producer, will no longer be able to grow most of their wheat. These same two countries also produce the bulk of the world’s rice for their own consumption and for export. Dr. Caldicott talks about the major forest fires in Australia. Hear her interview with Paul Carroll about forest fires. Later, she points to another factor that can destabilize nations – nuclear weapons proliferation. This entry was posted on Monday, June 22nd, 2009 at 12:00 am	and is filed under Uncategorized. You can follow any responses to this entry through the RSS 2.0 feed. Both comments and pings are currently closed.